Some residents of Enugu, particularly women, have increased their patronage for second-hand sweaters as the harmattan cold intensifies. 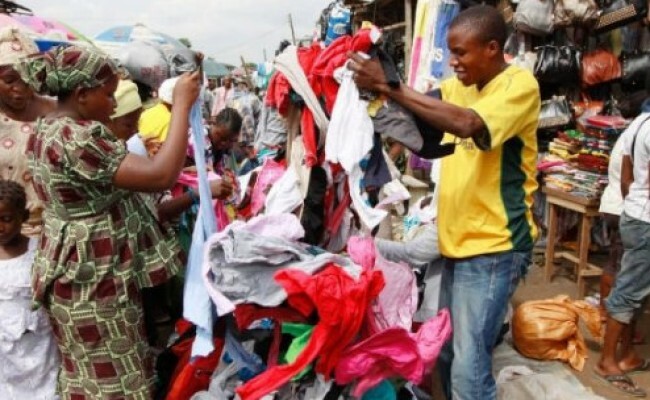 A News Agency of Nigeria (NAN) correspondent who visited the popular markets in the metropolis on Thursday reports that buyers swamped the sellers in markets for such sweaters. Some buyers told NAN that it was necessary to buy sweaters at this period of harmattan at an affordable cost to save them and the children from the biting cold. Mrs Regina Ozor, a buyer at Ogbette market, said that the harmattan was severe and that she had to buy the sweaters affordable in the second-hand clothes market so as to safeguard her and the children from cold which could lead to cough or asthma. “This year’s harmattan is too harsh, especially for children and if they are not well protected, they can easily be affected with cold which can definitely lead them to having cough and as well as developing asthma at tender age. “Prevention is better than cure because it can only cause someone a little to prevent a sickness than treating it. “That is why many women are coming to market just to buy cold protective wears mainly for their kids,” Ozor said. Another buyer, Mrs Ekwy Ilodibe, at the new market said that the high cost of new sweaters drove mothers to the second-hand market which was a bit cheaper. Ilodibe explained that children needed to be protected from harmattan with thick sweaters due to harsh cold associated with the season. Mr Solomon Egbuna, another buyer at the market, said that it was necessary for him to buy sweater in this period because of his health challenge. “Since the harmattan set in, I have been experiencing severe cough as well as chest pain which are associated to the harsh cold of harmattan,’’ according to Egbuna. Mr Emmanuel Orji, a dealer in second-hand sweaters at the Ogbette main market, said that the severity of the cold associated with the harmattan had made many, especially women, to rush for sweaters. Orji added that the cold could not be overlooked or ignored no matter how poor a person may be, thereby forcing many residents to patronise them. According to him, a good quality children’s sweater goes for between N700 and N1,500, while that of adults go for between N1,000 and N1,900. Mrs Chibuzor Nnamani, a dealer, said that despite the difficulties in bringing in the sweaters, including payment of import duties and harassment from the Custom officials, she had not quit the business because of its high patronage. “Since I import directly from the source, I pay heavily to Customs and sometimes the officials harass me on my way to Enugu from Lagos, though, it is a business that is patronised by everyone,” she said.